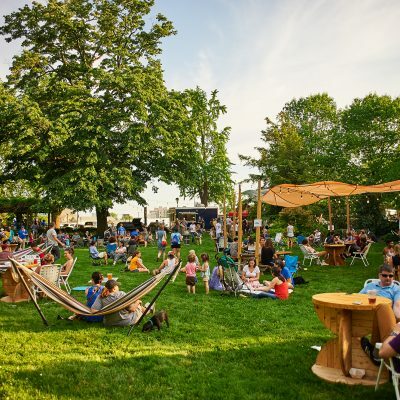 Follow this traveling community beer garden to different locations in Philly’s parks each week throughout the spring and summer. A portion of the proceeds goes back to the parks! Parks on Tap is Philadelphia’s traveling beer garden that gives back! It is a partnership with Philadelphia Parks and Recreation, Fairmount Park Conservancy and Avram Hornik of FCM Hospitality that brings a beer garden to dozens of different parks throughout the spring, summer, and fall. Parks on Tap is an initiative with the city that kicked off in 2016, aiming to engage the Philadelphia community and give back to the neighborhood parks. We provide fresh food, beer on tap, wine, snacks, and non-alcoholic beverages in a festive outdoor environment featuring comfortable chairs and hammocks, and clean restrooms. We also offer a variety of family friendly activities and weekly programming. Find all of the Parks on Tap locations here.